Live Blackjack Strategy - Expert Winning Blackjack Strategies! 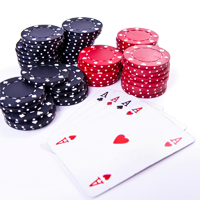 A range of Blackjack strategies have been developed over the years to try and improve a player's chances of beating the house. Here we take a look at some of the most famous Blackjack strategies devised by mathematicians and seasoned gamblers. 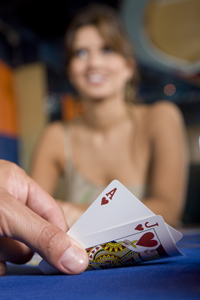 Basic Blackjack Strategy is based on the pure mathematics of the game. Basic strategies exist for every set of Blackjack rules and when followed correctly they will reduce the house edge to its minimum, which is usually to 0.5%. Basic Strategy charts dictate exactly how to play your first two cards in every possible situation, depending on the value of your cards and the value of the dealer's visible card. These Basic Strategy charts differ depending on variables such as which Blackjack rules you are playing by and how many decks are in use. Basic Strategies can be memorised to give you the best mathematical chance of losing the least amount possible to the house in the long term. Common Basic Strategy rules include: if you have 11- double, otherwise hit; with a hard hand of 8 or less - always hit; and if you have a pair of Aces or 8's – always split. Composite-Dependant Strategy dictates that you can increase your edge over the house even further. While Basic Strategy takes into account the value of your hand and the value of the dealer's visible card, Composite-Dependant Strategy takes into account the value of your hand and the precise composition of your hand. In other words the type of cards in your hand matter just as much as the total value of your hand when it comes to deciding how to play. Card Counting – popularised by famous card counter and mathematical genius Edward O. Thorp in his landmark 1962 publication 'Beat The Dealer', this strategy allows players to determine when they have a probable advantage over the house. Basically this involves players assigning a points score to cards that they see, allowing them to establish the ratio of high cards to low cards in a game. As high cards are more advantageous to the player, but low cards are more advantageous to the dealer, the player can use the points score to estimate their edge over the dealer. Shuffle Tracking – this strategy is mainly applicable to multi-deck Blackjack games. It involves tracking the progress of a group of cards during the play of the shoe, through the shuffle and then adjusting betting and playing decisions accordingly when those cards come into play from the new shoe. 1 SuperCasino £400 Code: 'Bumper' 8/10 Review Play Now! 2 BetVictor Casino £175 20% Match-up 8/10 Review Play Now! 3 William Hill Casino £150 150% Match-up 10/10 Review Play Now! 4 888 Casino £100 100% Match-up 7/10 Review Play Now! 5 Jackpot 247 £400 Code: 'Bumper' 8/10 Review Play Now! 6 Genting Casino £150 100% Match-up 9/10 Review Play Now! 7 Bet365 Casino £150 100% Match-up 9/10 Review Play Now! 8 188Bet Casino £50 100% Match-up 6/10 Review Play Now! Get exclusive bonuses, news and great reviews straight from LiveCasinos.co.uk to your inbox!